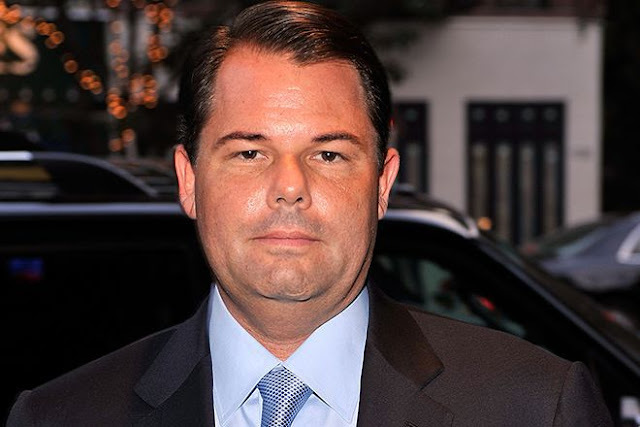 Paul David Pope said his father, Generoso Paul "Gene" Pope Jr., would be "turning in his grave" if he saw the one-sided direction David Pecker has taken the National Enquirer. Paul David Pope was interviewed in a special "Headliners" report on tabloid journalism that aired nationally last night on MSNBC. Citing the one-sided pro-Trump direction American Media Inc. has taken under Pecker's command, Pope said "My father would be turning over in his grave to see what his baby has become." Pope said Pecker has "weaponized" the National Enquirer to go after Trump detractors and advance the President's political agenda, whereas once the newspaper had a blind eye and just went after compelling stories regardless whom they involved or who won or lost. AMI's flagship publication, the National Enquirer "made its name by breaking the rules and being unconventional," said Pope. "My father told reporters to do whatever you have to do to get the story" like once taking a picture of Elvis Presley in his coffin or publishing a photo of Senator Gary Hart with his alleged girlfriend Donna Rice that ended his Presidential campaign. Pope said his father redefined the landscape of American journalism just as his grandfather Generoso Pope Jr's Il Progresso newspaper changed how Italian American Immigrants were viewed in New York and helped to bring them into the mainstream of American culture. According to Pope, his father invented a different kind of hard-hitting journalism resorting to methods to get the story frowned upon by mainstream media. Under his leadership, it would never become the promotional arm of any one political candidate or leader as Pecker has taken the once super dominant National Enquirer. Pope is planning a podcast on this and other subjects on behalf of a cause he is espousing called "Saving America," about which there will be more information forthcoming. Pope recently retained the international public relations firm TransMedia Group to publicize the impact he and his family have had on journalism by creating the most influential publication in the history of the United States. Pope cites the wealthiest man in America, Jeff Bezos, having to announce publicly "I am having an affair and I am being extorted" as evidence of how low the National Enquirer has sunk..